Associated Press Boston Marathon bombing survivor Marc Fucarile holds his thigh socket as he tests microprocessor-controlled prosthetic knees at the Medical Center Orthotics and Prosthetics in Boston. 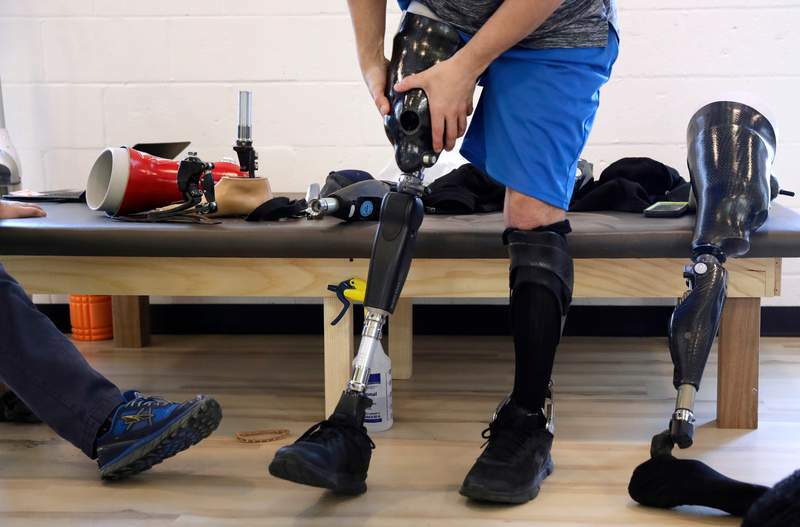 BOSTON – In the five years since the Boston Marathon bombing, medical science has made promising advances in amputations and artificial limbs, in part because of lessons learned from the victims and research dollars made available as a result of the attack. “The collective experience in the aftermath of the Boston Marathon bombing was a very positive one in the medical community, because there was a lot of crosstalk between military and civilian surgeons,” said Dr. Benjamin Potter, chief of orthopedics at Walter Reed National Military Medical Center in Maryland, where three survivors were treated and doctors are attempting some of the cutting-edge procedures.